GARDAÍ HAVE SAID that flood waters across Dublin have by and large receded overnight but areas continue to be subjected to disruption. The N4 is now open to all traffic from the M50 at junction 7. One lane has opened and one remains closed at Wolfe Tone Quay, delays can be expected in the area. They are encouraging commuters to the city to use public transport where possible. Motorists in Wicklow are also being warned not to use the Sally Gap and all access roads to Valleymount and Lacken, according to AA Roadwatch. A major emergency operation was invoked last night and this morning Gardaí say there is still flooding at Parnell Road, Harold’s Cross Road, Wolfe Tone Quay, Belgard Road, Strawberry Beds, and N11 at the UCD flyover. The Local Coordination Group, which includes representatives of the HSE, Dublin City Council and an Garda Síochána, met earlier this morning and will meet again at 9.30am to discuss the situation. Jurors are being asked not to attend at the Courts of Criminal Justice today as it has been closed due to the flooding – they are instead asked to report as normal tomorrow. There is no mains power supply in the Courts of Criminal Justice in Parkgate Street so no cases will take place there today. Other venues are being explored for the hearing of custody and bench warrant cases but it is anticipated most cases will be adjourned to other dates. More information is expected on www.courts.ie later today. Dundrum Town Centre is is closed due to the flooding this morning. McCabe’s Pharmacy in the centre is closed and said that any customers who require emergency medication can go to McCabe’s Pharmacy, 2 Sandyford Hall Centre, Kilgobbin Road, Dublin 18. Emergency pharmacy cover is available by phone at 01 2956368 / 012149741 or after 6.30pm contact 086 1734865. The Strawberry Beds in Lucan have reopened as has the Lower Lucan Road between Lucan Bridge and Tinkers Hill, AA Roadwatch says. There are reports of a collision on the M1 inbound at the bottom of the on-ramp from the M50, according to Dublin City FM. Latest report is that the vehicles have been moved to the hard shoulder. AA Roadwatch said that Harolds Cross Road has been closed to traffic approaching the Grand Canal – but this has no impact on Dublin Bus services. It also said that traffic on the n11/Stillorgan Road is being diverted up and over at the UCD flyover and that there are delays at Cornelscourt. Meanwhile, the N81 Dublin/Blessington Road is closed both ways at Jobstown in Tallaght, said AA Roadwatch. There are reports that there has been flooding in Killinarden Heights beside Killinarden Community School and the community centre. South Dublin Co Council is making contact with households that it knows have been affected and extra staff are manning the helpline number: 4149000. The N4 is closed to all inbound traffic from the M50 at junction 7 (Lucan / Palmerstown) except for buses. The South Dublin Co Council said this is due to an incident at Wolfe Tone Quay. Traffic is being diverted to the M50 northbound and southbound, South Dublin Co Council said. This is due to the closure of Wolfe Tone Quay. The South Quay and N4 remain open to outbound traffic, say Gardaí. Wolfe Tone Quay is closed to traffic, say Gardaí. A spokesperson from Dublin City Council, Tom Leahy, said that the city walls moved approximately 100mm during the flooding in this area. Lights are out at the junction of East Wall Road and Alfie Byrne Road. According to Dublin Bus, the North Quays have been closed at Heuston Station. All Westbound services will be affected. South Dublin County Council says that the Belgard Road is flooded but passable at Mayberry Road and outside the fire station. The N81 inbound is flooded but passable at Avonmore. The N81 is also still flooded at Jobstown with mud and abandoned vehicles on the road. South Dublin County Council is advising motorists to avoid this. According to South Dublin Co Council on Twitter, a manhole cover has lifted at the Maldron Hotel at the N81/Whitestown Way. It is asking people to take care until an emergency crew have dealt with this hazard. The N7 is open with spot flooding in places and a lot of anbandoned vehicles in hard shoulder. Motorists are advised to drive with caution. Gardaí say that main arterial roads are now open but driving conditions are challenging and motorists are asked to be aware of debris on the roads following last night’s heavy rain. Local authorities are currently working to clear debris and obstructions. Gardaí are advising that motorists returning to cars should ensure braking systems are working correctly. People returning to houses or business affected by flooding are advised to exercise caution as there may have been power failures in theses premises. Dublin Bus says it is operating a full bus service this morning but that diversions are in place on some routes and services may be subject to delays. A full list of the routes affected is available on www.dublinbus.ie Customers can also access information on the Dublin Bus Twitter and Facebook pages or phone the Dublin Bus Customer Information Line on 01 8734222. Luas green line services have been suspended in full due to a power outage. Luas tickets are valid on Dublin Bus services for the duration of disruption. The tram operator says there is a full service on the Red Line. Luas tickets are valid on Dublin Bus. Updates on are available on the Luas Twitter account. Delays are easing, with DART, Northern, Maynooth and M3 commuter trains experiencing delays of between 10 – 30 minutes. DART services have reopened between again between Dun Laoghaire and Dalkey. Services have been suspended at Glenageary for flooding assessment. DART and Commuter trains operating through Connolly are experiencing severe delays of between 30 – 70 minutes. The tree that fell near the Lansdowne Road area has been cleared but there are still severe delays. This is due to flood damage to signalling equipment in the Dublin area. On DART, Northern Commuter services, customers should expect delays as there are speed restrictions in some areas on the route. Bayside Station is closed due to a flooded station building, customers should use Sutton or Howth Junction Stations. Maynooth services are operating also with minor delays, but will not serve Drumcondra Station. Belfast, Sligo and Rosslare services will also operate, with some minor delays possible. All services from Heuston station are operating. Roadsweeper trucks have been dispatched to clear debris so that all priority routes can be kept open and all available staff from Roads, Parks, Environment, Housing and Water Sections of the council and are being deployed to areas on a priority basis. Council water crews are attending at Wainsfort, Osprey Drive where the Poddle had burst its banks. Tom Leahy from Dublin City Council told Morning Ireland that sandbags were deployed last night to vulnerable areas. He said the council did the best they could as did the local authorities, who worked together over the last 24 hours. We’ve compiled a Twitter list of relevant public transport services who are tweeting the latest travel information. 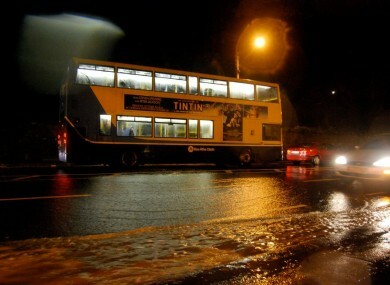 Email “Floodwaters recede but disruptions still in place across Dublin”. Feedback on “Floodwaters recede but disruptions still in place across Dublin”.